Usually, I write about babies. How cute they are, how expensive they are, and what a joy it is to have one of my own. I am, once again, writing about babies. These babies are neither cute nor joy-inspiring, but I’m sure they are expensive. Then again, Politicians always are. In the final presidential debate before the South Carolina primary, moderator John King pointedly asked GOP hopeful and former Speaker of the House Newt Gingrich if he asked his second wife if she would be willing to engage in an open marriage with the woman who would ultimately become his current wife (with his track record, I wouldn’t put money on her being his final wife). Somehow, in a twist more shocking than any Stephen King novel, Gingrich came out on top of the question, calling King despicable and asking how the moderator would dare to begin a presidential debate with such a topic. Embarrassed, King backpedaled, insisting that the story had been present on multiple networks and he was just trying to clarify. 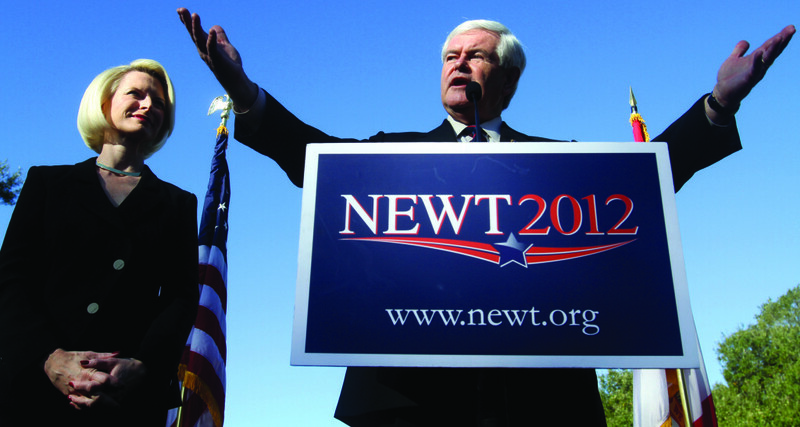 All the while, Newt stood there with a smug look on his face as the audience erupted in cheers. As a journalist, I admit I am still angry at John King. Besides Anderson “Awesome” Cooper, King is one of my favorite interviewers; when he dug his journalistic claws into Donald Trump, my heart skipped many, many beats. But that night, when Gingrich turned his two affairs and his blatant disregard for a wife suffering from multiple sclerosis into a massive amount of approval from a clearly delusional audience, with King apologizing and backing away. It hurt. I felt betrayed. He could have slaughtered him. Why didn’t King ask Gingrich why he touts marriage as such a sacred and important institution if he can’t seem to find a way to stay in one long enough for the ink on the license to dry? Or why is he allowed to get married, commit adultery (which, though I in no way claim to be a Bible scholar, I’m pretty sure is breaking one of the ten commandments) then get remarried three separate times, when homosexuals getting married would surely sully this sacred foundation that our country apparently thrives upon? If that weren’t enough, why on earth did King not make the connection that for all of Gingrich’s talk of “family values,” the candidate was engaging in his own affair while leading the lynch mob on President Clinton in the 90’s; hypocrisy at its absolute worst. Why weren’t those questions asked? Why did King let Gingrich get away with acting indignant, as if he had no right to ask something of that nature? Haven’t the personal lives of politicians always been on display? Gingrich took a stern tone with King and was able to turn the question around, making the moderator seem like he was out to personally get Gingrich; that, I believe, is what gave Gingrich the surge he needed to win the South Carolina primary, and that’s a big deal. No Republican candidate has ever represented the GOP without winning South Carolina, so, history would tell us, it will be Gingrich against Barack Obama come November. As an Obama supporter, this doesn’t worry me; I think Obama will win reelection by a landslide. Nevertheless, it’s embarrassing for the GOP. Newt Gingrich? Really? I’m sure King is still kicking himself for letting Gingrich get the best of him, as well he should; as a highly professional journalist, I found this display unacceptable. I was screaming the questions at the television, just like my husband shouted all season at the Dallas Cowboys; both endeavors were futile. It doesn’t really matter who the GOP representative is, they are all equally scary, but it would be nice if people would take into consideration when the huge pot starts calling the kettle black.